Sunday Links: Andy Warhol - Plus: MBIP Coming Attractions! 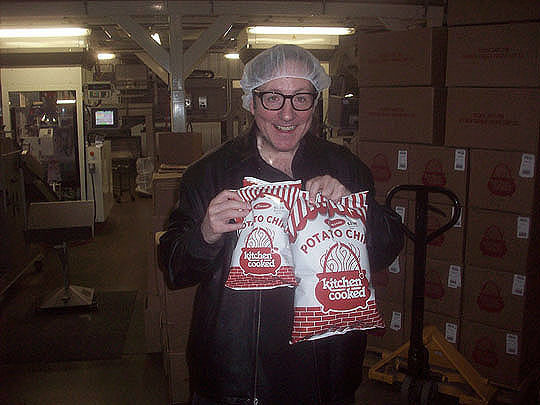 I happened to see that a couple weeks ago was the 50th anniversary of the bizarre shooting of Andy Warhol. On June 3rd, 1968, Valerie Solanas calmly walked into Warhol’s art studio, shot him and another man and then just walked away. She was later arrested and it ended up becoming the subject matter for a full length motion picture. 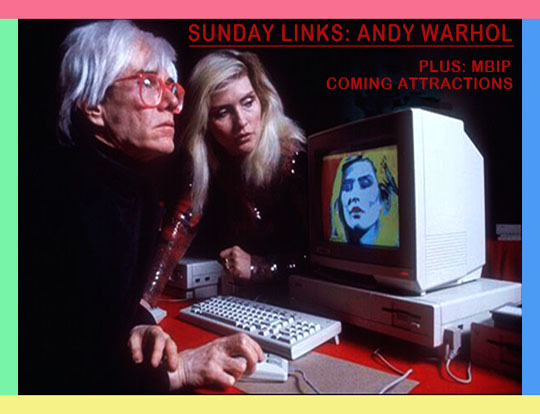 This started me reading some online articles on Andy Warhol and below are a half a dozen Andy Warhol links including a story by Yours Fooly who had a six degrees of separation Andy Warhol moment in New York City. And of course there’s the MBIP Coming Attractions for next week’s shenanigans on the blog. The Day Valerie Solanas Shot Andy Warhol - This is a good story of what happened on the day that Andy Warhol got shot. 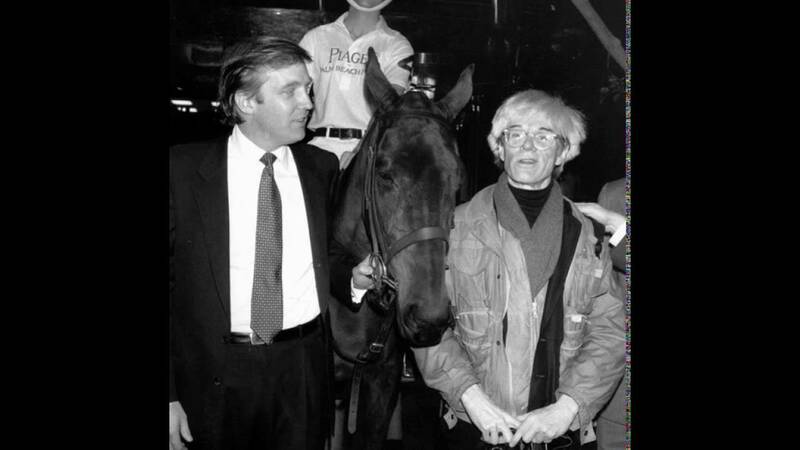 Your ultimate guide to Andy Warhol - This is a good “A to Z” guide of Andy Warhol’s life and career. 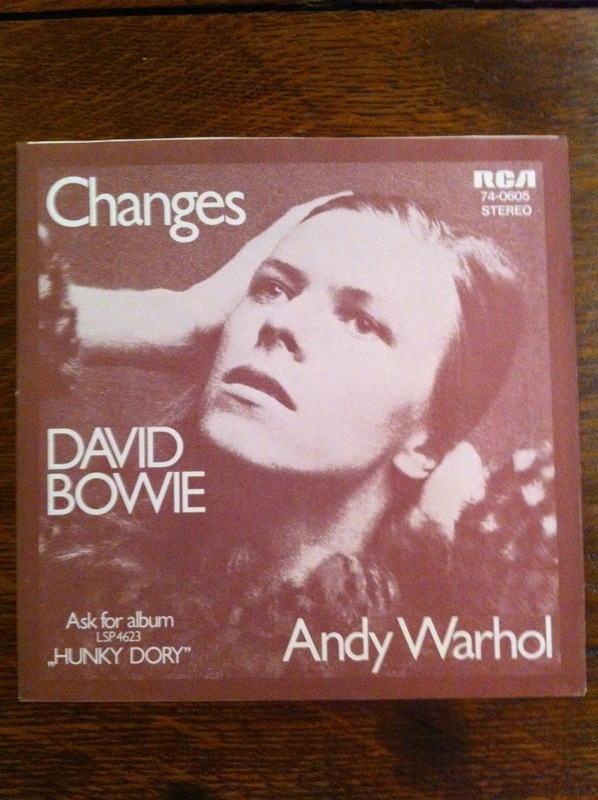 Andy Warhol - album covers - I remember the Velvet Underground banana album cover and “Sticky Fingers” by The Rolling Stones, but I had no idea that Andy Warhol had been designing album covers since 1949! He started out in jazz and then moved into the world of rock ‘n roll in the ‘60’s. Andy Warhol and Edie Sedgwick: A Brief, White-Hot, and Totally Doomed Romance - Edie Sedgwick was Andy Warhol’s ultimate muse, until the relationship drove them both a little crazy, she a little more than him. An Andy Warhol Travel Guide To New York City - A Warhol walking tour of New York City. Andy Warhol Statue—10:57PM Union Square - This is a post from my Marty After Dark blog where I took photos of the Andy Warhol statue and then wrote a story about meeting Warhol’s manager and business associate Paul Morrissey. It’s one of my favorite New York stories. 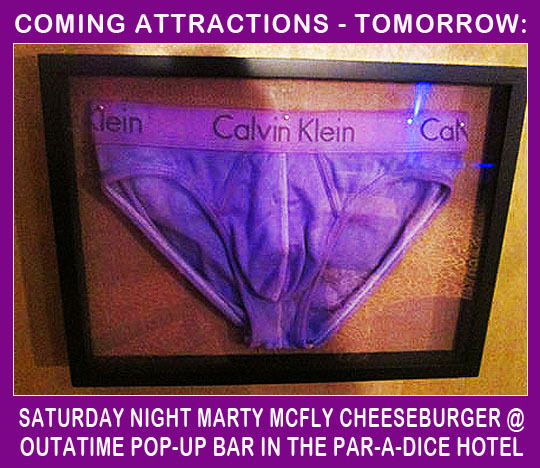 Last night I went to the new pop up Back To The Future bar in the Par-A-Dice Hotel with my friends Amber and Joe. If you haven’t heard about this click here for more information and we’ll have photos of it and our Saturday night dinner tomorrow. Tuesday we continue the 13 months of chicken tour with a stop at the Jubilee Cafe in Edwards, Illinois for a chicken lunch with my friend, Terry Grawey. Wednesday is the Third Annual MBIP Invitational Golf Tournament. We did this last year at Wee Tee, but Wee Tee is long gone, so tune in to see where this year’s tournament took place and who won the tournament this year! Thursday will be a special post about the release of a new record here in Peoria. Friday will be the monthly Thirsty-Third Friday and this month we’re having a Fake Family Dinner at The Untamed Chef that should be a lot of fun. Okay, I have to get to work on all of this stuff, so have a funny, sunny, runny and bunny Sunday and we’ll see you all tomorrow! Related Posts: Sunday Links: The Assassination of Robert Kennedy, The Runaways and John Lennon’s Lost Weekend. I do a weekly MBIP segment on the radio show The Church Of Rock which is broadcast live on Sunday nights, worldwide out of Oregon on Sunday nights. Every week I pick a song and give a little talk about it before the song is played on the show. The hosts of the show are Rev. Derek Moody (some of you know him as Bloody Mess) and Sister Tracy. The show starts at 9PM CST and my segment will air around 9:15PM! The song I chose for this week is "Lawdy Miss Clawdy" by Elvis Presley from his '68 Comeback Special. I'm going to talk about watching that special when I was 10-years-old and how it changed my view of Elvis Presley. You can listen live by streaming from the KSKQ website right here! You should also check out the Church of Rock YouTube channel with archived interviews with everyone from GG Allin to Davy Jones!